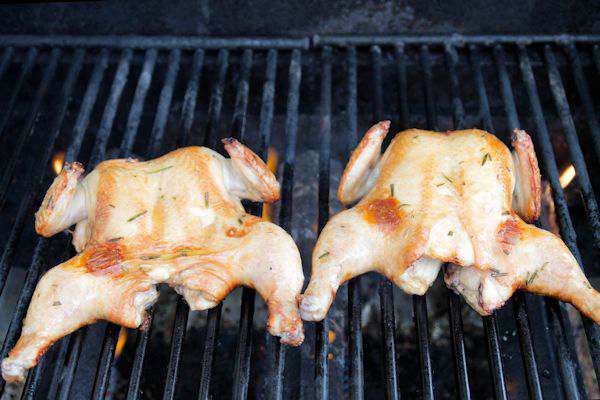 Grilling Cornish Hens are so easy and yummy. Follow the easy step by step recipe for preparing the hens and a tasty marinade. Summer is slowly coming to an end, but here in Central Florida, we love our long summer season. Grilling is such a big part of all the warm days we have here. Easy cleanup and I don’t have to heat up the kitchen. I just have to time grilling in between all the rain showers we have this time of the year. Mr. G and I also love to grill foods which normally are not grilled. If it can be baked, put in the crockpot or fried, it can be grilled. 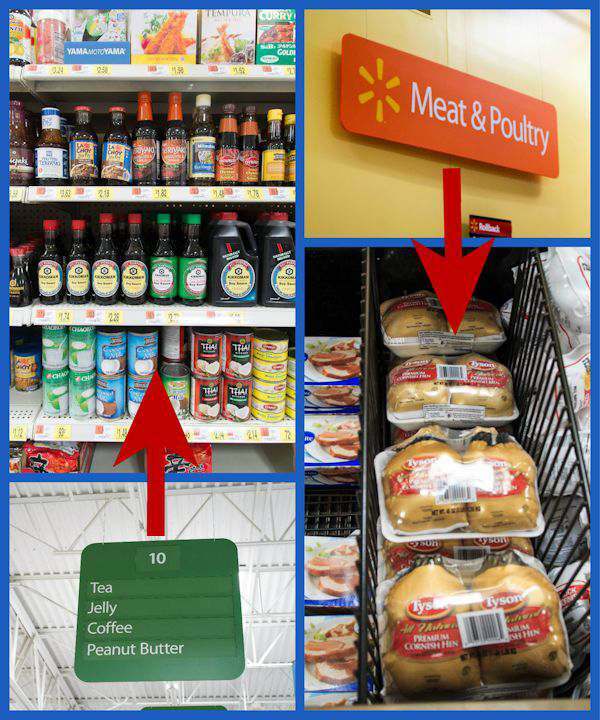 While shopping at my local Walmart, I was trying to figure something different for supper. Seems here lately I have been in a rut of cooking the same ole thing. Do you have the same problem? Even though hubby would never complain about his dinner, I know he would like something different and special sometimes. While looking in the meat area, I noticed some frozen Tyson® Cornish Hens. It’s been years since I had prepared one of these nice birds and this would be perfect for something special to fix for hubby. I love that they are packaged with two hens. Consider them a single serving hen. I also love that Tyson Cornish Hens are all natural too. No hormones or steroids added. And what a great item for the grill too. We grill chicken all the time, so why not a smaller hen. 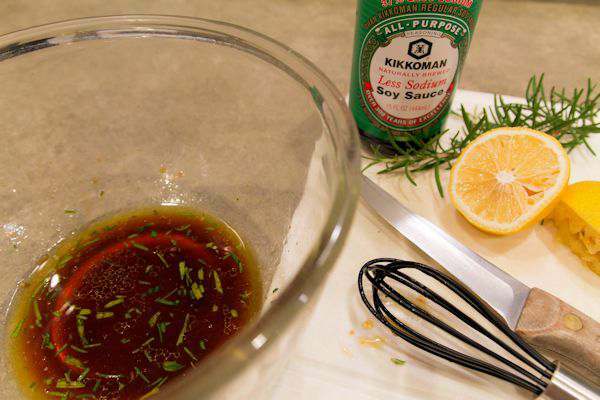 I will also make a nice marinade/sauce made from fresh rosemary, lemons, and Kikkoman® Soy Sauce. 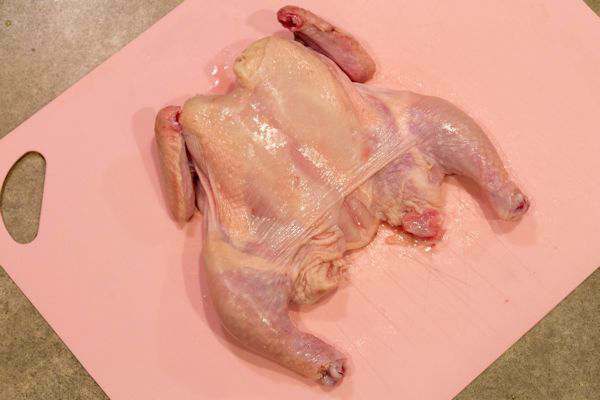 I grab my flexible cutting mat, then take a pair of kitchen scissors and cut down the sides of the backbone so you will be able to grill the hens flat. Grilling the hens flat will make sure heat is distributed evenly. You can see how the hen opens nicely and flattens out. I also cut off the tips of the wings (they burn too easily) and any extra fat. Turn the hen over and press down over the breast area with your hand to make sure it’s laying as flat as possible. Add all ingredients in a bowl and whisk until blended. I use the low sodium soy sauce, but the regular version would be just fine. No need to add any more salt to the marinade. I love how Kikkoman soy sauce adds great flavor and enhances so many of my meals now. You can also use the soy sauce to make a brine for a really juicy hen. As the hens come to room temperature, I will brush the hens a few times with the marinade. You can also add some while grilling. Prepare your gas grill by turning it on and letting it heat up on high. I turn on all 3 burners and close the cover. After a few minutes, I will use my grill brush to clean the grates. You really need the grilling area to be clean to prevent sticking. If using charcoal, you will have to start this process much earlier. Lay the hens with the ribs facing the fire, as in the picture above. I leave the burners on high, close the cover and leave for about 10 minutes. If you have burners where the flame is really high on the high setting, you might want to use a medium setting. You can see in the picture that my high setting is rather low. Old grill. After 10 minutes, I will then flip over the birds and leave for about 5 minutes. This is where are that beautiful brown grill color comes from. At this time I did turn down the heat to medium. When the 5 minutes were up, I turned the birds back over and just turned off the grill, closed the cover and let them sit while I prepared the rest of my meal. 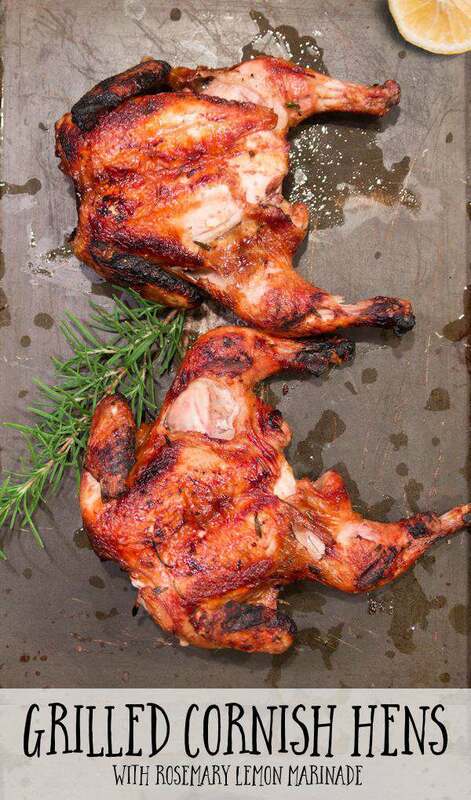 Less than 20 minutes of grilling time and look at how these hens turned out. They were so tender the legs started pulling apart from the hens. Hubby and I couldn’t believe how juicy the hens were. I love the taste of the grill on just about any meat. The marinade gave it such a lovely taste also. I have to admit, I loved the dark meat the best and I’m not really fond of dark meat on hens. Be sure to check out all the different ways to prepare Tyson Cornish Hens and Kikkoman Sauces on the social hubs. Remember, Cornish Hens aren’t just for special occasions. Have you ever prepared Cornish Hens before and what is your favorite recipe? That sounds so good. 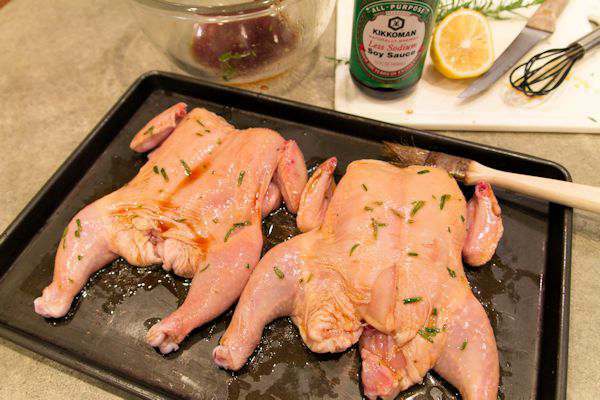 I haven’t had a cornish hen in a million years, so I will have to try your marinade the next time I make one. 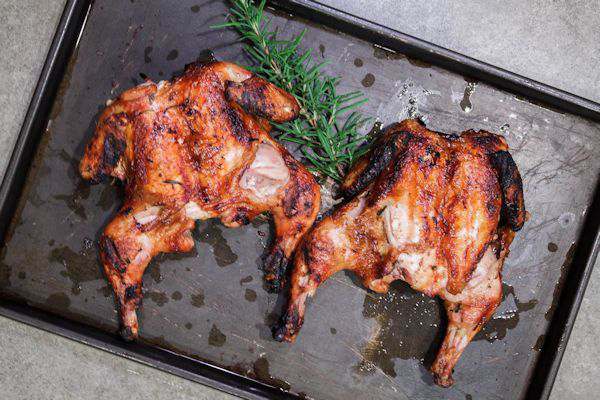 Looks divine and your image shows you know what you are doing Grilled cornish hen I have to try the marinade next time my hen came out so pale. Looks and sounds delicious. I don;t cook very often these days, but I might have to try this one. I can’t say that I have ever had a cornish hen before. I bet my husband would love to try that on the grill. Oh this sounds perfect. We haven’t grilled hens in a long time and they sound so good with that marinade. I am so craving for this! I love this. Thanks for sharing your recipe. Haven’t tried this kind of marinade before. Thanks for sharing the recipe. I’d love to try making this grilled chicken too. They look so delicious! I’d love to try this at home, thanks for sharing easy to make recipes like always. Chicken is my favorite!! I’ve never tried to make this one for dinner, it looks easy, I wanted to try it out. This sounds really delicious. I might have to make this. I’m sick and tired of everything else I’ve been making for dinner. It’s time to spice it up! That looks so tasty! I haven’t had a Cornish hen in a while. I can’t wait to try this. These look delish. Sadly, whole birds scare me when it comes to cooking. It might be from my turkey disaster a few years ago. I’ve never thought of grilling! I’ve never had a cornish hen, but this looks so good! I can’t wait to try this one! Thanks so much for sharing how to prepare these. My boyfriend has asked for these before, I’ll have to try the recipe. I haven’t had cornish hens in a long time. I am going to add them to my shopping list and make them this week. Yours look really good and now I remember how much I used to love them.